How to use Windows Backup to Backup & Restore your Personal Files. This tutorial contains detailed instructions on how to create a backup of your personal files by using the Windows "Backup & Restore" feature. in Windows 10, 8, 7 & Vista OS. One of the most useful features in Windows, is the "Backup and Restore" feature that can help you easily backup and restore your personal files and also gives you the ability to specify how often the backup will be executed in order to have your backup always updated. The backup of your data is a very important action! Do not skip it! I have always advised my customers to backup their data regularly because I believe that keeping backups is the safest way to avoid data loss. If you follow this advice, then you will minimize the risk of losing your files by any reason in the future, like a disk failure or if a ransomware destroys your files. Related Articles: How to Backup your Personal Files with SyncBackFree. 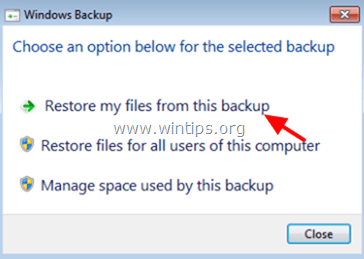 How to Backup or Restore your Personal Data with Windows Backup feature. Part 1. How to backup your personal files with Windows Backup. Part 2. How to restore your personal files from a Windows Backup. Part 1. How to Backup your Personal Data with Windows Backup. Requirements: A media with enough free space to save the backup (e.g. an External USB Hard Drive, an empty optical DVD disk, etc.)*. * Important: The safest method to backup your data is to save the backup to another media and then (after the backup) to keep that media offline. 1. Connect to your computer a media with enough empty space to save the backup. In Windows 7: click the Start menu and navigate to Control Panel > Backup your computer. * Note: Windows 10 offers also the 'File History' feature' to backup your personal files. The main difference between the "Windows Backup & Restore" feature and the 'File History' is that the Windows backup has also the abilities to create full system images and to backup entire drives. 3. At "Backup or restore your files" screen, click Set up backup. 4. Select a drive to backup your files (e.g. an External USB drive) and press Next. c. The "AppData"* folder from all accounts. d. The Windows state: A System Image of your current Windows State, if there is enough space on the backup media. ** The "AppData" or "Application Data" folder contains data from every installed program on your computer. Usually, the only really important information that is stored inside the "AppData" folder is your e-Mail data (Outlook, Windows Live Mail, Thunderbird). * Note: Below are mentioned(in Bold letters) all the important folders with your personal files that you must include on the backup. Don't forget to include any other folder that contains important information to you. 7. At the next screen review your selections and specify (if you want) how often you want Windows to backup your files, by clicking the Change schedule link. 8. Finally choose Save settings and run backup, in order to start immediately the first backup of your files. 9. When the backup process is started, you will see a screen with the backup progress. (Wait until the backup is completed). Part 2. How to Restore files & folders from a Windows Backup. B. Navigate to the backup location (where you saved the backup, e.g. your external USB disk) and double click at the file folder that has the same name as your computer's name. (e.g. "WIN7-BLOG" n this tutorial). Browse for files, if you want to restore individual files from the backup. Browse for folders. if you want to restore individual folders from the backup. 3. Next, explore the backup contents, until you find the folder (or file) that you want to restore. 4. When you locate the folder (or file) that you want to restore, highlight it and press the Add folder (or "Add File") button. 5. After that you should return to "Browse or search your backup for files and folders to restore" options. At this point you can select additional files (or folders) to restore, or if you have finished with your selections, press Next. * Note: I prefer to restore the files in an alternate location to avoid overwriting. 7. Finally, when the restore process is completed, select the View restored files option, to view the restored files. « How to fix: One or more network protocols are missing on this computer. » How to Setup FTP Server with FileZilla Server software.